Files with cl file extension can also be found as source codes written in Common Lisp programming language. The cl file extension is associated with the Lisp (or LISP) programming language. Lisp is a family of computer programming languages that was originally specified in 1958. Today, the most widely known general-purpose Lisp dialects are Common Lisp and Scheme. The cl file contains source code written in Common Lisp programming language. It is a simple text file that can be opened in various text editors. However it is better to edit source code with text editors that support Common Lisp source code highlighting. 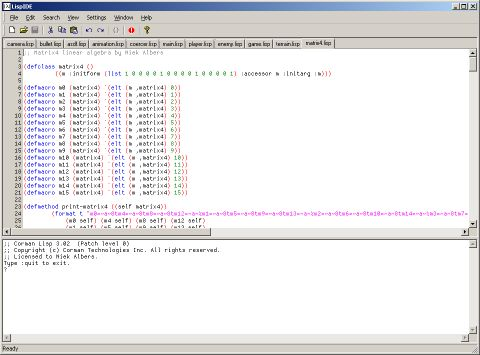 LispIDE is basic source code editor for several Lisp and Scheme implementations. LispIDE is able to work with: Corman Common Lisp, Steel Bank Common Lisp, CLISP, Gnu Common Lisp, Gambit Scheme, Bigloo Scheme etc. Use any text editor to view the content of Common Lisp programming language source code files. Source codes are usually not converted, but compiled.